Mid size Thadobati with clear but worn inner circles. 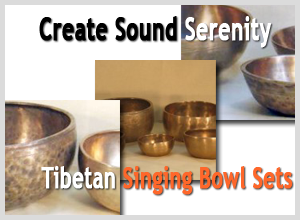 Wild and full of sound on the strike this bowl simplifies unusually into a singing high overtone. Longevity and harmony are just ok. Good bowl to play the bass off the rim, the first overtone comes on strong and fades quickly, the long lasting high, on the other hand, plays off the rim with a wand and sustains. With overtones at D#5, D6, A6. Perfect A3 – 220 Hz.